CyberKnife stereotactic body radiation therapy (SBRT) is becoming increasingly used for cancer treatment and, to maximize its clinical application, it is important to define the dosimetric characteristics, optimal dose and fractionation regimens. The aim of this study was to evaluate the dose fall-off in two fractionated regimens of CyberKnife SBRT during the treatment of thoracic spinal metastasis. Patients with spinal metastasis involving a vertebra and pedicle were treated with 40 Gy in 5 fractions (n = 4), and patients with spinal metastasis involving only a vertebra received 33 Gy in 3 fractions (n = 4). A new approach was used to measure absolute dose fall-off distance, relative dose fall-off distance, and the dose fall-off per unit distance along four reference directions in the axial plane. Patients treated with 33 Gy/3 fractions had a greater absolute dose fall-off distance in direction 1 (from the point with maximum dose [Dmax] towards the spinal cord) and direction 3 (the opposite of the direction 1), a greater relative dose fall-off distance in direction 3, and a lower dose fall-off per unit distance in direction 1 and 3 compared to patients treated with 40 Gy/5 fractions (all p < 0.05). Overall, the dose fall-off towards the spinal cord is rapid during the treatment of thoracic spinal metastasis with CyberKnife SBRT, which allows a higher dose of radiation to be delivered to the tumor and, at the same time, better protection of the spinal cord. Katakami N, Kunikane H, Takeda K, Takayama K, Sawa T, Saito H, et al. Prospective study on the incidence of bone metastasis (BM) and skeletal-related events (SREs) in patients (pts) with stage IIIB and IV lung cancer-CSP-HOR 13. J Thorac Oncol. 2014;9(2):231-8. Kuchuk M, Kuchuk I, Sabri E, Hutton B, Clemons M, Wheatley-Price P. The incidence and clinical impact of bone metastases in non-small cell lung cancer. Lung Cancer. 2015;89(2):197-202. Hernandez RK, Adhia A, Wade SW, O'Connor E, Arellano J, Francis K, et al. Prevalence of bone metastases and bone-targeting agent use among solid tumor patients in the United States. Clin Epidemiol. 2015;7:335-45. Greco C, Pares O, Pimentel N, Moser E, Louro V, Morales X, et al. Spinal metastases: From conventional fractionated radiotherapy to single-dose SBRT. Rep Pract Oncol Radiother. 2015;20(6):454-63. Chang UK, Youn SM, Park SQ, Rhee CH. Clinical results of cyberknife(r) radiosurgery for spinal metastases. J Korean Neurosurg Soc. 2009;46(6):538-44. Falk S, Dickenson AH. Pain and nociception: mechanisms of cancer-induced bone pain. J Clin Oncol. 2014;32(16):1647-54. Lee S, Chun M. Pain relief by Cyberknife radiosurgery for spinal metastasis. Tumori. 2012;98(2):238-42. Robson P. Metastatic spinal cord compression: a rare but important complication of cancer. Clin Med (Lond). 2014;14(5):542-5. Wu JS, Wong R, Johnston M, Bezjak A, Whelan T, Cancer Care Ontario Practice Guidelines Initiative Supportive Care G. Meta-analysis of dose-fractionation radiotherapy trials for the palliation of painful bone metastases. Int J Radiat Oncol Biol Phys. 2003;55(3):594-605. Finn MA, Vrionis FD, Schmidt MH. Spinal radiosurgery for metastatic disease of the spine. Cancer Control. 2007;14(4):405-11. Wang XS, Rhines LD, Shiu AS, Yang JN, Selek U, Gning I, et al. Stereotactic body radiation therapy for management of spinal metastases in patients without spinal cord compression: a phase 1-2 trial. Lancet Oncol. 2012;13(4):395-402. Hayashi S, Tanaka H, Hoshi H. Palliative external-beam radiotherapy for bone metastases from hepatocellular carcinoma. World J Hepatol. 2014;6(12):923-9. Antypas C, Pantelis E. Performance evaluation of a CyberKnife G4 image-guided robotic stereotactic radiosurgery system. Phys Med Biol. 2008;53(17):4697-718. De Bari B, Alongi F, Mortellaro G, Mazzola R, Schiappacasse L, Guckenberger M. Spinal metastases: Is stereotactic body radiation therapy supported by evidences? Crit Rev Oncol Hematol. 2016;98:147-58. Paddick I, Lippitz B. A simple dose gradient measurement tool to complement the conformity index. J Neurosurg. 2006;105 Suppl:194-201. 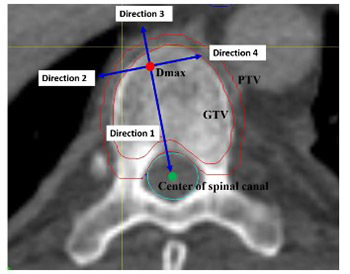 Cox BW, Spratt DE, Lovelock M, Bilsky MH, Lis E, Ryu S, et al.. International Spine Radiosurgery Consortium consensus guidelines for target volume definition in spinal stereotactic radiosurgery. Int J Radiat Oncol Biol Phys. 2012;83(5):e597-e605. Timmerman RD. An overview of hypofractionation and introduction to this issue of seminars in radiation oncology. Semin Radiat Oncol. 2008;18(4):215-22. Hossain S, Xia P, Huang K, Descovich M, Chuang C, Gottschalk AR, et al. Dose gradient near target-normal structure interface for nonisocentric CyberKnife and isocentric intensity-modulated body radiotherapy for prostate cancer. Int J Radiat Oncol Biol Phys. 2010;78(1):58-63.